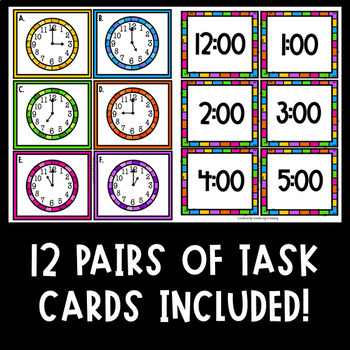 These Time to the Nearest Hour Task Cards are a great way to practice or review telling time to the nearest hour! Easily differentiate with 2 fun ways to use these cards! Option 1: Students match the analog clock card with its digital time card. 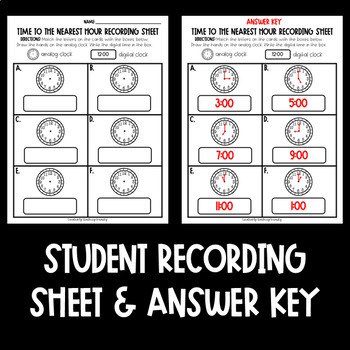 Then, students use the letter on the task card to find the corresponding answer box on their recording sheet. They draw the hands on the analog clock and record the digital time. 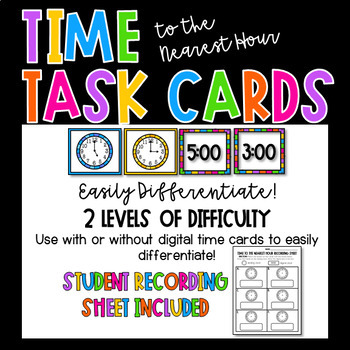 Students must still be able to match the analog clock with the digital time, but the visual aide of both the analog clock and the digital time provides support for students when recording their answers! 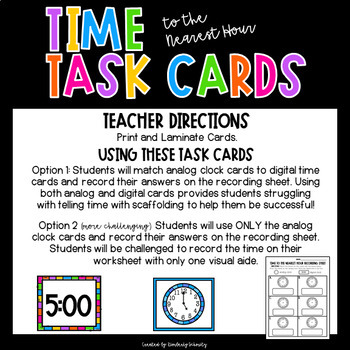 Option 2 (more challenging): Students are given only the analog clock cards. They use the letter on the task card to find the corresponding answer box on their recording sheet. They draw the hands on the analog clock to match the task card, and record the digital time. Students have the visual aide of the analog clock, but they must rely on their own knowledge of time to write the digital time.